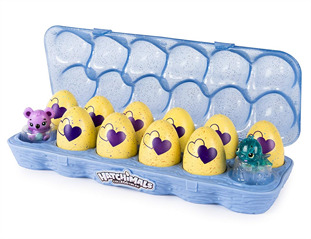 The Hatchimals Colleggtibles Season 3 Dozen is part of the new Hatchimals Colleggtibles Season 3 Hatch Friends Forever collection. Just as we experienced the fun of Hatchimals Surprise, the twinning excitement is now downsizing for the Colleggtibles! Each of the Hatch Friends Forever characters in the new line has a BFF, squad, or twin. The twin characters are just slightly smaller in size and like Hatchimals Surprise, hidden inside the same Colleggtibles eggs. BFF and squad characters are hidden in separate eggs, and you'll need to use the collector's guide to figure out what characters are BFFs and/or what squad they belong to. The speckled color of the eggs can help you make a match. There are more than 100 characters to collect in the new line, including some special limited edition characters from Shimmering Sands that are flocked. For example, we found Shimmering Sands' Shimmering Skunkle. With the 12-pack, kids get two pre-hatched characters plus 10 eggs to hatch to find out who's inside. As with the previous Colleggtibles lines, here's how to hatch: Simply warm the egg using the heat of your hands until the purple hearts turn pink. Then press to crack it open. This Colleggtibles carton also includes one exclusive Newtnat characters for added collectibility. 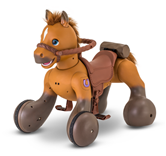 We like how Spin Master continues to breath new life into this property, inspiring not only new stories (thanks to the new characters) but also nurturing play, engagement and cooperation through collectibility. Downsizing the twin surprise adds to the fun of the "hatch" for kids, but we found trying to match the best friends even more fun because it adds to the chase. The Hatchimals Colleggtibles Season 3 Hatch Friends Forever 12-pack is for ages 5 and up from Spin Master. 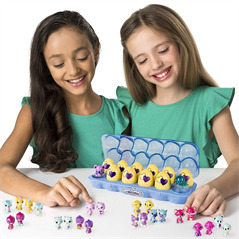 It will appeal to current Hatchimals collectors, while possibly bringing new fans into the fold thanks to the new dose of excitement added with the BFF matching and twins hidden inside. Newtnat is a character exclusive only to the 12-pack/dozen set. You will not find this character (as of yet) hidden elsewhere. Characters are denoted on the collector's guide as common, rare, ultra, rare and limited-edition. The limited edition flocked characters are exclusive to the Shimmering Sands squad. The color of the speckles on the Colleggtibles eggs tell you to which squad they belong. Hatchimals is still a hit with kids! Season 2 of the CollEGGtibles is filled with surprises - some are even hidden surprises!